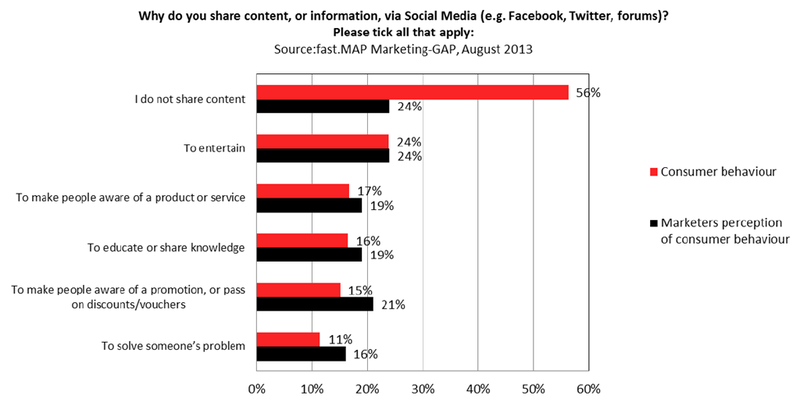 As marketers, we know a large part of our job is to collect as much data about customers and prospects as possible. Feeding the database gives us leads to qualify and valuable data to mine. So it makes perfect sense when we have something of value to these people—like some great content or special offers—that we should make them jump through a few data hoops before we let them at it. The least they could do is share their name, email, and maybe some lifestyle interests so we can contact them again in future. Isn’t it? No! It turns out this is actually one of the worst things most marketers do online. Give it to them. Just let them have it. No forms to fill, no data to share. Just instant, free access to the content they desire. But here’s the kicker. If they like what you gave them, now is the perfect time to ask them to do you a favour in return. Perhaps they could give you just a few pieces of contact information so you can stay in touch and share more great content like this in future. You see, people who have just been given something are much more likely to give something in return. It’s called reciprocity, that sense of indebtedness that is hard-wired into human behaviour. And in tests, flipping the online data collection to take place after the gift is received allows marketers to capture twice as much data as before. 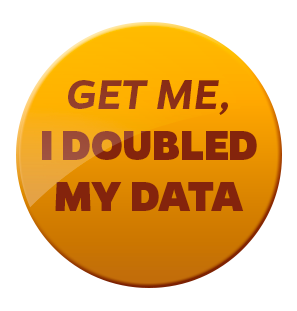 Yes, that’s double the data for no extra effort. Not only that, but it’s often better quality data too. The tyre kickers and time wasters have got what they wanted and are unlikely to want to stay in touch. But the people who really appreciate your content, who know that it can bring value into to their lives, have everything to gain by sharing their contact details. But don’t just take my word for it. Put it to the test. Flip that data collection page in your website, or trial the alternatives alongside each other in an A/B test. If your website visitors are anything like every test sample I’ve ever encountered, you’ll soon see you data counts and quality climbing. I know it feels counter-intuitive but, honestly, this really works. Now, stop thinking about it. Go put it to the test! We humans love seeing choices or lists presented in groups of three. Three gives a natural balance to things, as does five or seven. But three really is the magic number for marketers and copywriters. A recent study for the Make-A-Wish Foundation sought to find the messaging sweet spot for securing charitable donations. They randomly assigned a different set of reasons to research participants, each of which was designed to persuade them to part with their hard earned money. One group received two egoistic reasons to give, another received two altruistic reasons to donate, and a third received all four reasons combined. Those in the last group, who were presented with four reasons to give, were less likely to donate than the other groups who received just two. It seems that at a count of four, the attempt to persuade had been too obvious, resulting in the participants actually being dissuaded to donate. In another test, subjects were shown ads for a brand of shampoo that carried between one and six benefit claims. Those who were given an ad carrying just three claims rated the shampoo more highly than those receiving more or fewer claims. Again, it would appear that one or two benefits are not quite enough to persuade us, yet four or more start to feel like desperation, resulting in scepticism that throws into doubt the veracity of all of the claims. So, next time you’re trying to persuade someone, keep your list of reasons why they should believe you to three. Simple. As. That. We live in a fast-changing world. Which means the longer you’ve held an opinion, the greater the chances your views may have fallen behind the times. Overall, marketers expect around twice as many people to be “happy to receive” marketing communications than consumers claim. Across the 29 industries examined, the most welcomed sector for email marketing amongst consumers is ‘competitions’, appreciated by 32% of consumers. The least welcome are mortgages (6%) and loans/credit cards (7%), the appeal of which was over-estimated by marketers by more than a factor of two (at 15% and 18% respectively). In fact, 58% of consumers now state they would prefer not to be contacted at all, through any channel, by companies they have no relationship with. Marketers again underestimate the extent of consumer rejection by almost 25%, believing that only 44% of consumers would feel this way. Almost half (45%) of consumers now claim to hang up straight away when they receive a marketing or sales call, that’s up from 36% in 2011. Almost 1 in 10 (the mischievous 9%) will leave the phone off the hook to tie up the call centre line! Around a third (32%) of consumers will open direct mail from any company (down from 38% in 2011), but marketers under-estimate this at 24%. 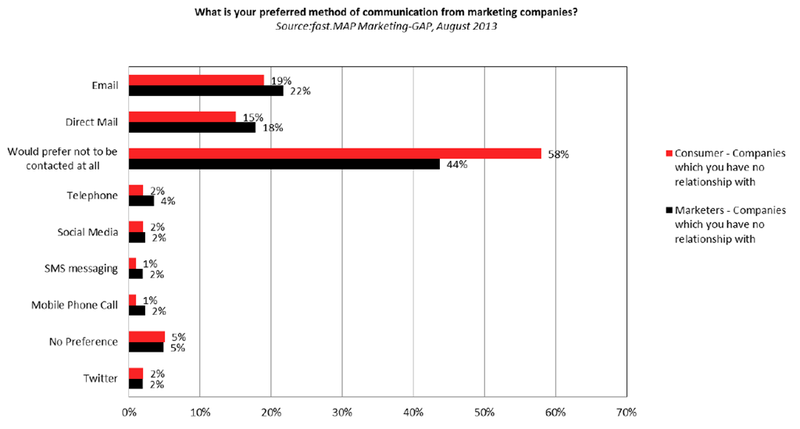 It seems the general public is still more likely to open direct mail than the industry believes. It’s not all good news though; almost one in four consumers (23%) say they now don’t open any direct mail, up from 13% in 2011. Interestingly, marketers also routinely overestimate the value of creativity in some channels. For direct mail materials, a third of marketers (33%) think interesting packaging will ensure it gets opened, but only 18% of consumers agree. Similarly one in four marketers (25%) think design can increase open rates, but only 9% of consumers share this sentiment. An attractive envelope can motivate 10% of consumers to open a direct mail pack, but that is well short of the 18% estimated by marketers. Many businesspeople are terrified of negative consumer reviews, with marketers estimating that 23% of people share negative experiences through review sites. But the reality is that only a tiny minority (4%) of consumers behave this way. At least we know which devices consumers use these days. Most people have a tablet and smartphone, right? Nope! The laptop and desktop computer remain by far the most popular tools for internet access, underestimated by marketers by 45% and 30% respectively . Now we know why those fancy tablet and smartphone apps alone were not enough to hit last quarter;’s sales target. And while we’re on the topic of coupon discounts, only 20% of consumers claim to have used Groupon in the last year, well short of the 50% estimated by marketers. Similarly, newspaper collectible offers like The Sun Holidays and Daily Mirror LEGO are only used by 7% of consumers, against a 21% prediction by marketers. Most consumers, it would seem, simply cannot be bothered with collecting tokens any more. Consumers love price offers, far more than most marketers realise or are prepared to admit. 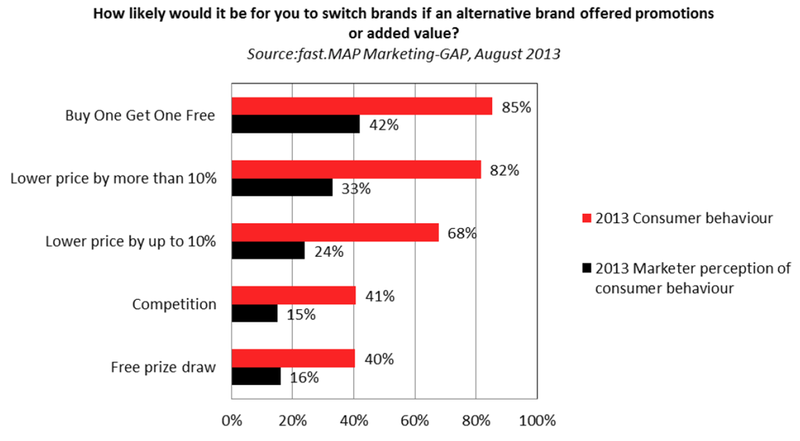 A staggering 85% of consumers would be happy to switch brand if an alternative brand offered a ‘Buy One Get One Free (BOGOF) deal, but only 42% of marketers believe this could happen. Even a 10% price advantage would be enough to switch brands for 68% of shoppers, far more than the 24% claimed by marketing professionals. A quarter of marketers believe that Corporate Social Responsibility (CSR) is unimportant, but only 7% of consumer agree, with the majority (60%) saying they feel it is very or quite important. Proof, if it were needed, that consumers expect companies to do the right thing and be held to account if their actions don’t benefit society as a whole. I’ve shared a lot of data in this blog post. The headline findings though are consistent: many consumer attitudes are changing very rapidly and marketers are often out of tune with real world consumers. The only way to find out if your long-held opinions may have passed their expiry date is to stay closely connected to your customers. Get out and speak with your customers, live in their shoes, see how they live their lives. 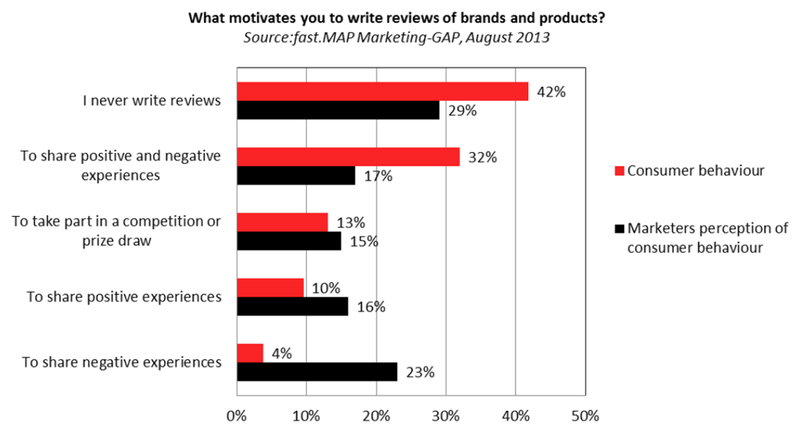 The opinion gap between consumers and marketers is as big as ever. What will you do, right now, to close the gap in your organisation?